AUD is growing against USD. Since the end of the last trading week, it has grown by more than 150 points. Yesterday the instrument erected and tested new local maximum and strong resistance level of 0.8020, and then fell to 0.7940 and entered the sideways consolidations. Such a wide movement is due to the fact that Australian currency is overbought, which is preventing it from growing due to the closing of profitable long positions at the strong resistance levels. Today the pair has returned to the level of 0.7985 and consolidated around it. Despite the negative Australian unemployment data publication, national currency stays strong mainly due to the significant decrease of USD in the beginning of the year. At the end of the week, US employment market, building sector and consumer sentiments data are worth traders’ attention. The upward momentum can maintain, the pair will test the level of 0.8020, but then it will consolidate within the current sideways channel with a possibility of deeper correction to the levels of 0.7915, 0.7900 and new upward trend after it. In the middle term the further growth of the pair to the highs since the beginning of August (0.8100, 0.8125) and long correction with the possibility of a reverse of the upward trend from the key resistance levels, are expected. RBA position can cause the breaking of the trend. The regulator has repeatedly mentioned that the high rate of the national currency affects the inflation growth and economic state of the country negatively. On the 4-hour chart, technical indicators give a growth signal, MACD keeps the high volumes of long positions, and Bollinger Bands are pointed upwards. 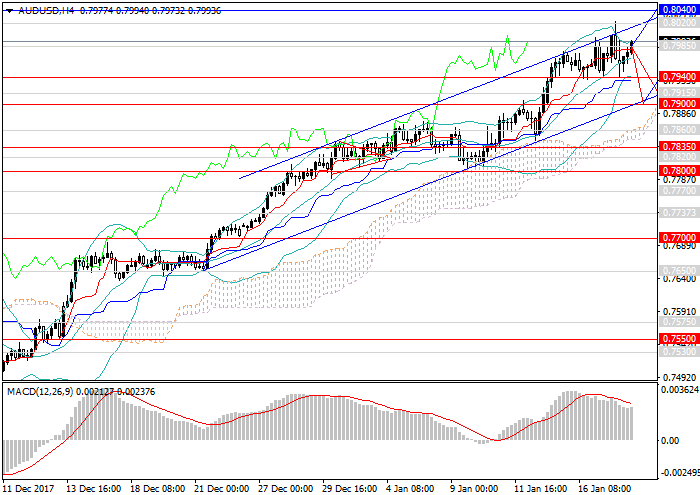 Resistance levels: 0.8020, 0.8040, 0.8065, 0.8100, 0.8125, 0.8150. Support levels: 0.7985, 0.7940, 0.7915, 0.7900, 0.7860, 0.7835, 0.7820, 0.7800, 0.7770. It is relevant to increase the volume of long positions at the current level and open pending long positions at the levels of 0.7915, 0.7900 with the targets at 0.8040, 0.8065 and stop loss 0.7870.